which one breaking out of the gate was ED? Those three certainly had good competitive spirit coming out the gate, them boys was trying! Coming along nicely, I can't even shave without resting my shoulder once or twice so I know how you feel. 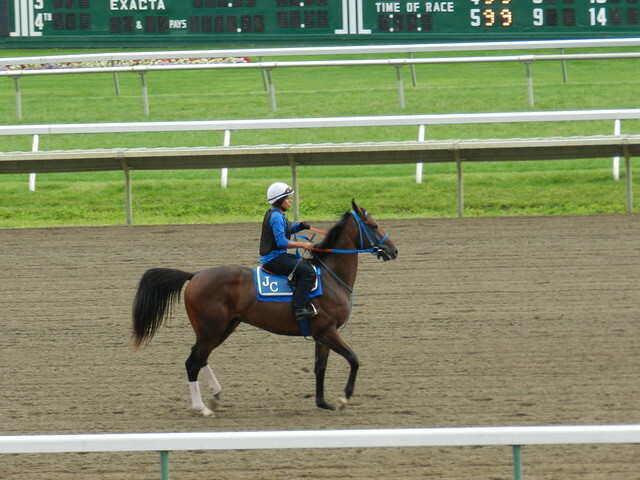 He breezed this morning, much too fast..... 36.2, a full second faster than eight days ago. I think he'll have a different breeze partner next time which is probably going to be in 10 days since he went faster than we all wanted. A colt that can't run faster than 37 secs. in 3 furlong should go home before I waste time, effort, and treasure, so the 36 and change would make me a very happy owner. My opinion is the exact opposite of Jeff's. This looks like a pretty nice horse but he's still a baby. The last thing I'd want is to push him to fast, to early... this was only the horses second official work and he sure does not need to be close to being the bullet work at this point. As I see it, I'm risking way more than I'm gaining by going that fast. It's easy to put the speed into a talented horse just before he runs, not so easy to deal with speed crazy babies that still need their gate cards or come out of the 'too fast' work with ouchy shins. Sounds to me like you are looking out for your horse and that can never be the wrong way to go. Jeff, a fast work won't prove a thing on race day. Given a choice, he'd probably run as fast as he can as far as he can but that's not what the game is about. He needs to go slow early and finish fast, not go at three quarter speed for three furlongs and run the fourth at half speed. The work was reported as a half in 49.4. 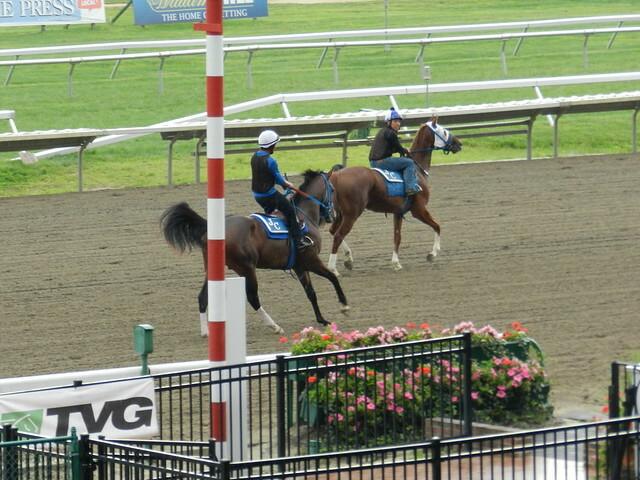 His breeze mate's work was reported as 36.4 to EB. I did not record the last eighth of a mile so I can't say how close that reported time was. When there are over 100 horses who breeze in a day you are lucky if your time is even within a half second of what you clock them yourself out. Tap, has he been galloped on turf yet? Just curious if the aptitude is there for racing choices. I was told when I asked in FL that he gets over the dirt track so well that there was no need to gallop him over the grass. I was told that he should be good on all surfaces though, but that he's probably going to prefer running short, or at least shorter than a mile and a quarter. He has two relatives who are sired by Roar who have been running out in CA and neither have gone further than six furlongs. They are Obsess and Tasty Treat and they are out of a half sister to GiGi's dam. It's funny too because he's not built the way Babs is and she's the one who is bred to be a grass loving miler. Great pictures, love the 'Happy Camper' photo. ED looks great. 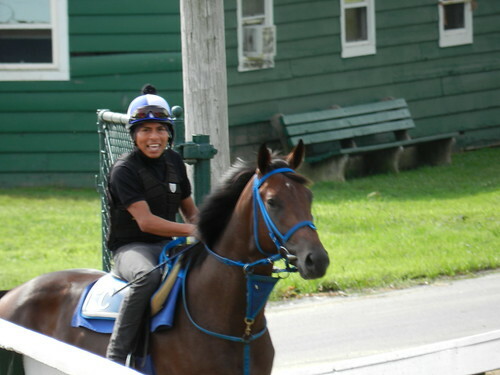 Half mile breeze from the gate tomorrow. Getting closer to a start. Hopefully when he's ready there will actually be a maiden race for two year olds at Monmouth Park. We needed to castrate him the other day as there was some "pinching" going on that caused him to shift his weight to the front, thus causing some minor shin problems. While I can't relate to that feeling, I'm sure there are some members of this forum who can. 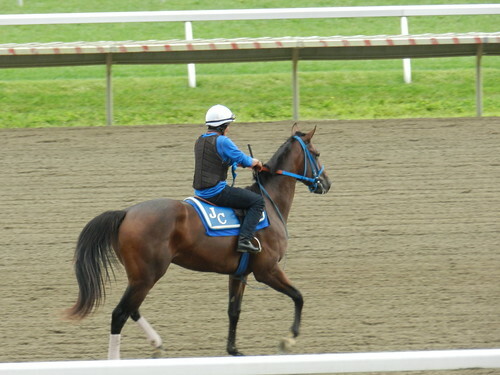 He's back to jogging and should be ready to resume galloping this week. Apparently, it's not a matter of what can bother a horse in training, it's just how much it's going to set them back.